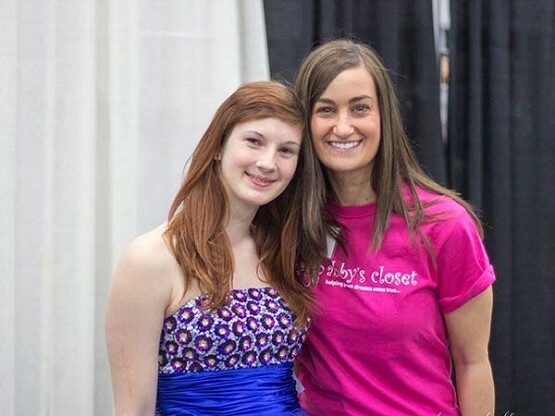 A participant in last year’s Abby’s Closet prom dress giveaway stands with the nonprofit’s founder, Abby Egland. High school women will walk away with a free prom dress during Abby’s Closet’s 13th annual prom gown giveaway. Held March 18 from 8 a.m. to 4 p.m. and March 19 from 10 a.m. to 2 p.m. at the Oregon Convention Center in Portland, the event will feature more than 6,000 prom dresses ranging from size 0-26. The mission of Abby’s Closet, an Oregon-based nonprofit, is to inspire confidence and respect in high school women by providing free formal gowns for prom or other memorable events. For some students, getting a free dress from Abby’s Closet is the only way they’re able to attend prom. Founded in 2004, Abby’s Closet has given away 20,000 dresses, and in doing so promoted education, confidence and inclusiveness. The organization also awards a $1,000 college scholarship each year. The goal of Abby’s Closet is to make every participant feel special, beautiful and confident.